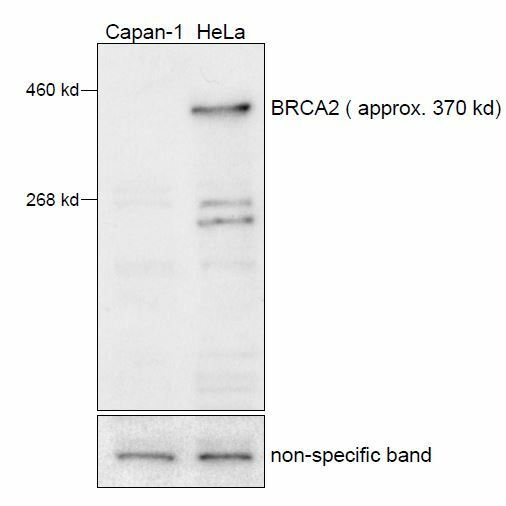 Relevance Breast Cancer Type 2 susceptibility protein (BRCA2) is a tumour suppressor gene. BRCA2 is involved in the repair of chromosomal damage, specifically in localising Rad51 to double strand breaks. BRCA2 and BRCA1 are frequently mutated in cases of hereditary breast and ovarian cancer. Zhang et al. 2012. Clin Cancer Res. 18(21):5961-71. PMID: 22977194. FoxM1 inhibition sensitizes resistant glioblastoma cells to temozolomide by downregulating the expression of DNA-repair gene Rad51. Badie et al. 2010. Nat Struct Mol Biol. 17(12):1461-9. PMID: 21076401. BRCA2 acts as a RAD51 loader to facilitate telomere replication and capping.